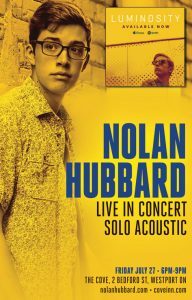 Explore Westport Ontario » Blog Archive » Nolan Hubbard at the Cove Inn! Nolan Hubbard at the Cove Inn! Nolan Hubbard boldly emerges as vocalist, guitarist and composer of evocative acoustic-pop masterpieces with the forthcoming release of his debut album and his moving and memorable lead-off single Today. The album was recorded in Nashville alongside top session players, and was produced by Canadian industry veteran Douglas Romanow. The time spent in Music City USA proved to be edifying and encouraging for Hubbard, as he felt both in awe of the surroundings but also emboldened by the experience – awed by the significance of being one of the mecca’s of the music business, but also emboldened because he came to realize that he had what it took as a songwriter and player to hang with some of the world’s best. Born and raised in the small eastern Ontario community of Gananoque, just east of Kingston, Hubbard grew up in a home immersed in music, particularly what might be called the modern Great Canadian Songbook. Hubbard got his first guitar at age 11, taking to the instrument with a dedication and obvious ability and quickly becoming a self-taught prodigy. By 17, his tastes had begun to change as he became more artistically confident and adventurous, expanding his repertoire into a more acoustic style. At the same time, he started to experiment with singing along to his playing, revealing a voice that was surprisingly soulful, impactful and one that made people listen intently. He knew immediately he wanted to be able to move people with just a guitar, his voice and his songs. The song Sandbanks is an affectionate ode to a popular beach area in Prince Edward County in Ontario, but Hubbard said it could apply to any place that evokes warm, wonderful affectionate memories. This album is a game changer for Hubbard, as he’s stepped out with a confident and strong debut – a collection of songs that are accessible, compelling and which wind their way into people’s souls. It’s a record that will undoubtedly make music lovers, cultural tastemakers and the music industry feel good about the future of popular music in Canada.